Hiring a Dunedin Ceiling Contractor should involve more than just making a few phone calls and picking out a texture. After all, a Dunedin Ceiling Contractor will spend several days working around all your prized possessions. It pays to take some time to evaluate who will be doing this type of home improvement project. Be wary of anyone who asks for a substantial down payment, and never give anyone more than 50% of the price up front. 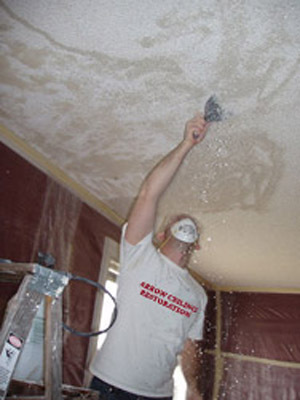 No job is too small and no structure is too high for Arrow Ceiling's ceiling services, which includes Popcorn Ceiling Removal, Popcorn Ceiling Repair, Drywall Repair, and Texture Ceilings and Walls. We're reliable and quick to do every job. We use only the best ceiling products for all of our Dunedin ceiling services. If you're looking for a Dunedin Ceiling Contractor Specializing in Popcorn Ceiling Removal, Popcorn Ceiling Repair, Drywall Repair, and Texture Ceilings and Walls, contact Arrow Ceiling Restoration today at (727) 804-5411, or complete our estimate request form.